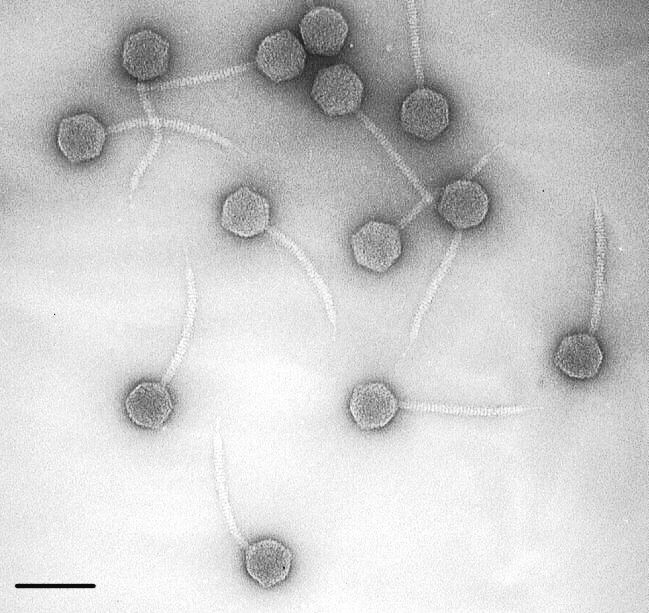 Bacteriophage Lambda, the lysogenic phage that infects E. coli. Bock laboratories. University of Wisconsin-Madison. Lysogenic or temperate infection rarely results in lysis of the bacterial host cell. Lysogenic viruses, such as lambda which infects E. coli, have a different strategy than lytic viruses for their replication. After penetration, the virus DNA integrates into the bacterial chromosome and it becomes replicated every time the cell duplicates its chromosomal DNA during normal cell division. The life cycle of a lysogenic bacteriophage is illustrated below. 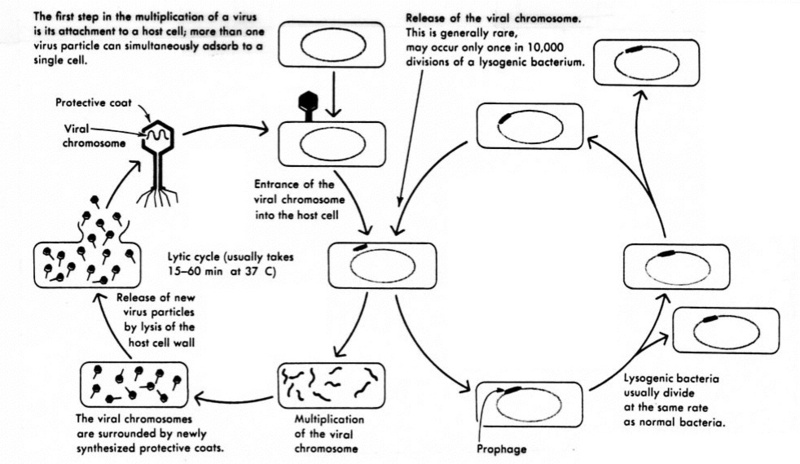 The lysogenic cycle of a temperate bacteriophage such as lambda. Temperate viruses usually do not kill the host bacterial cells they infect. Their chromosome becomes integrated into a specific section of the host cell chromosome. Such phage DNA is called prophage and the host bacteria are said to be lysogenized. In the prophage state all the phage genes except one are repressed. None of the usual early proteins or structural proteins are formed. The phage gene that is expressed is an important one because it codes for the synthesis of a repressor molecule that prevents the synthesis of phage enzymes and proteins required for the lytic cycle. If the synthesis of the repressor molecule stops or if the repressor becomes inactivated, an enzyme encoded by the prophage is synthesized which excises the viral DNA from the bacterial chromosome. This excised DNA (the phage genome) can now behave like a lytic virus, that is to produce new viral particles and eventually lyse the host cell (see diagram above). This spontaneous derepression is a rare event occurring about one in 10,000 divisions of a lysogenic bacterium., but it assures that new phage are formed which can proceed to infect other cells. Usually it is difficult to recognize lysogenic bacteria because lysogenic and nonlysogenic cells appear identical. But in a few situations, the prophage supplies genetic information such that the lysogenic bacteria exhibit a new characteristic (new phenotype), not displayed by the nonlysogenic cell, a phenomenon called lysogenic conversion. Lysogenic conversion has some interesting manifestations in pathogenic bacteria that only exert certain determinants of virulence when they are in a lysogenized state. Hence, Corynebacterium diphtheriae can only produce the toxin responsible for the disease if it carries a temperate virus called phage beta. Only lysogenized streptococci produce the erythrogenic toxin (pyrogenic exotoxin) which causes the skin rash of scarlet fever; and some botulinum toxins are synthesized only by lysogenized strains of C. botulinum. 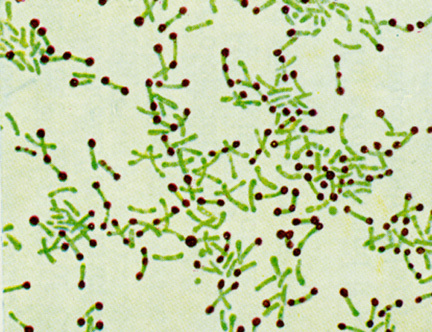 Corynebacterium diphtheriae only produces diphtheria toxin when lysogenized by beta phage.C. diphtheriae strains that lack the prophage do not produce diphtheria toxin and do not cause the disease diphtheria. Surprisingly, the genetic information for production of the toxin is found to be on the phage chromosome, rather than the bacterial chromosome. A similar phenomenon to lysogenic conversion exists in the relationship between an animal tumor virus and its host cell. In both instances, viral DNA is incorporated into the host cell genome, and there is a coincidental change in the phenotype of the cell. Some human cancers may be caused by viruses which establish a state in human cells analogous to lysogeny in bacteria. Phage therapy is the therapeutic use of lytic bacteriophages to treat pathogenic bacterial infections. Phage therapy is an alternative to antibiotics being developed for clinical use by research groups in Eastern Europe and the U.S. After having been extensively used and developed mainly in former Soviet Union countries for about 90 years, phage therapies for a variety of bacterial and poly microbial infections are now becoming available on an experimental basis in other countries, including the U.S. The principles of phage therapy have potential applications not only in human medicine, but also in dentistry, veterinary science, food science and agriculture. An important benefit of phage therapy is derived from the observation that bacteriophages are much more specific than most antibiotics that are in clinical use. Theoretically, phage therapy is harmless to the eucaryotic host undergoing therapy, and it should not affect the beneficial normal flora of the host. Phage therapy also has few, if any, side effects, as opposed to drugs, and does not stress the liver. Since phages are self-replicating in their target bacterial cell, a single, small dose is theoretically efficacious. On the other hand, this specificity may also be disadvantageous because a specific phage will only kill a bacterium if it is a match to the specific subspecies. Thus, phage mixtures may be applied to improve the chances of success, or clinical samples can be taken and an appropriate phage identified and grown. Phages are currently being used therapeutically to treat bacterial infections that do not respond to conventional antibiotics, particularly in the country of Georgia. They are reported to be especially successful where bacteria have constructed a biofilm composed of a polysaccharide matrix that antibiotics cannot penetrate.